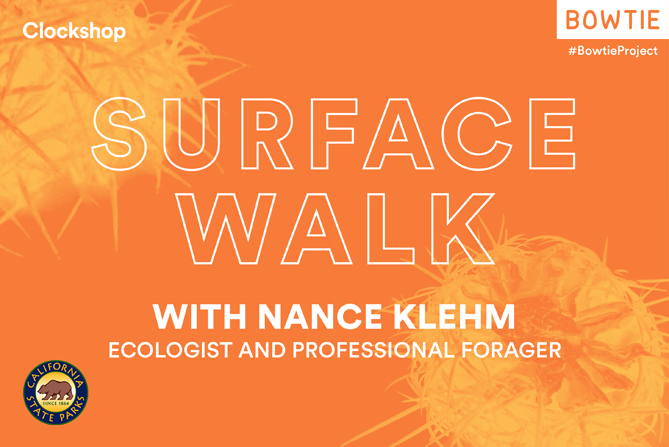 Ecologist and professional forager Nance Klehm will lead a walk at the Bowtie Project exploring the human uses and ecological functions of the native and spontaneous vegetation at the site. On this walk we will investigate how the vegetation relates to the ecology and vitality of the soil that supports it. Surface Walk is part of Nance Klehm’s Bowtie residency titled Double Pairing. Nance Klehm has been an ecological systems designer, landscaper, horticultural consultant, and permacultural grower for more than two decades. Her approach is centered on instigating change by activating extant communities. Her work demonstrates her lifelong commitment to redefining the way human populations coexist with plant and animal systems on this planet. 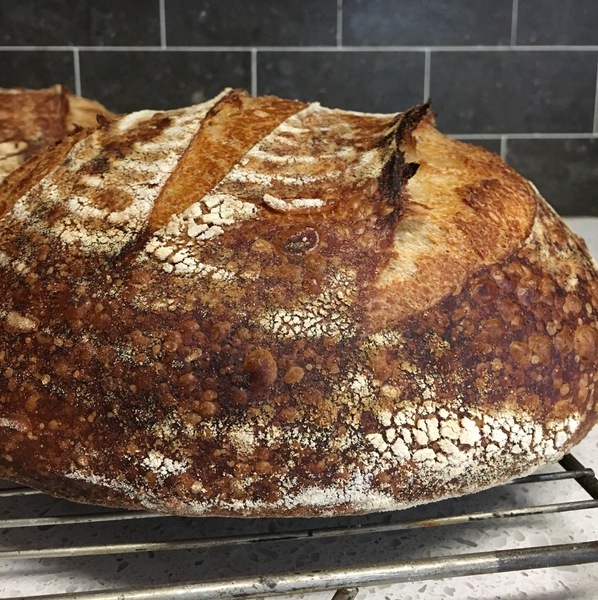 Want to learn how to bake your own tasty sourdough loaves? Take a class with the Los Angeles Bread Baker’s amazing instructor Dana Morgan on February 18th at the community oven in Westchester. Not to be missed! This small class will teach you the basics of Tartine-style sourdough bread baking. 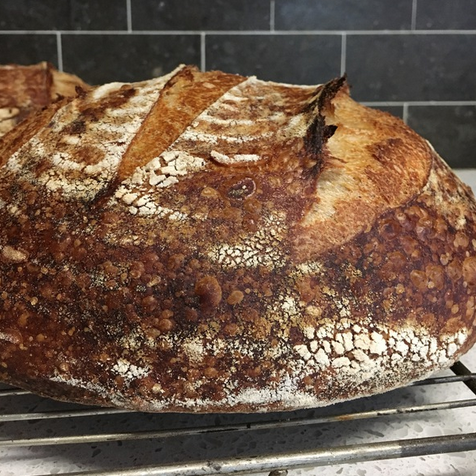 Come learn about making and maintaining sourdough starter and how to mix, divide, shape and time the fermentation of amazing artisan bread inspired by Chad Robertson at Tartine Bakery in San Francisco. Prepare your sourdough in class and bake it at home the next day. Ingredients for your bread will be provided. Head over to the Los Angeles Bread Baker’s Meetup to sign up. 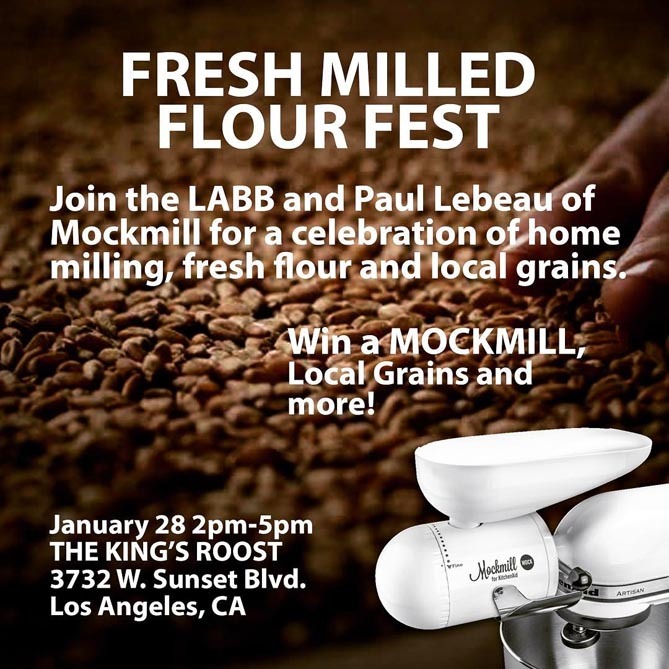 Southern California Farmers, Millers and Bakers are meeting up in Silverlake to learn about home grain milling with Paul LeBeau, Managing director of the German mill maker, Wolfgang Mock. We are raffling 2 MockMills along with various locally grown whole grains donated by California farmers. While there is no charge for raffle tickets or the event, we will sell raffle tickets for a third mill and grain basket to benefit the California Grain Campaign, the effort to require 20% of farmers market baked goods to be made with local whole grains by the year 2020. Local farmers, millers, and bakers will be there to meet with Paul LeBeau. Paul is the managing director of German based home mill manufacturing company Wolfgang Mock. They have designed an affordable, compact, stone mill attachment for the Kitchen-Aid and, like Roe Sie, the owner of The King’s Roost, they believe that every home should have a grain mill. To share the benefits of milling fresh flour at home. Benefits like making fresher healthier more nutritious foods for less money, while supporting the local economy, increasing food security and decreasing our impact on the environment. The King’s Roost in Silver Lake is LA’s first and only urban homesteading store and learning center. We believe it is the only brick and mortar store in the country that carries a full line of home grain mills. We provide classes and supplies not just for milling and baking, but also for chicken keeping, bee keeping, soap and candle making, brewing, fermenting, and aquaponics. If that’s not enough incentive, each class breaks for a pizza lunch baked in the Westchester Community Oven at Holy Nativity Episcopal Church. Sign up for the classes through the Los Angeles Bread Baker’s Meetup. The classes take place at 10:45-3:00pm with a break for the pizza lunch at 12:00pm. Cost: $65.00/class. Free banneton for shaping bread ($15 value) if you sign up for 2 of the classes. Class size is limited to 14 bakers so sign up soon! All the big names in the natural beekeeping movement (including Michael Bush and Dee Lusby and many more) are coming to SoCal this weekend. And I’ll be doing a crazy talk on Sunday morning as well as scoring some future podcast guests. Hope to see some of you there. More info and the schedule can be found here. Join HoneyLove August 19-21, 2016 for an unforgettable weekend filled with educational lectures and workshops, hands-on demonstrations, the latest in natural beekeeping techniques and findings, an elite collection of exhibitors and sponsors, rare opportunities for you to connect with likeminded beeks, sweet raw honey tastings from around the world AND OUR ANNUAL YELLOW TIE EVENT on August 19th, 6-9pm! There will also be “Special Interest Groups” on both days covering a wide range of topics for both beginner and advanced beekeepers (see full schedule at the bottom of this page). Limited tickets available to this awesome weekend so REGISTER NOW!